As the French Empire collapsed between 1812 and 1815, artists throughout Europe were left uncertain and adrift. The final abdication of Emperor Napoleon, clearing the way for a restored monarchy, profoundly unsettled prevailing national, religious, and social boundaries. 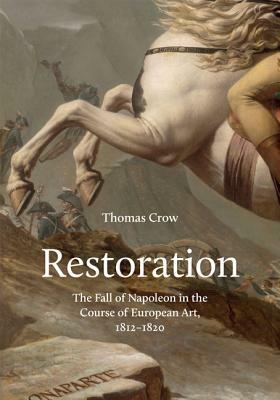 In Restoration, Thomas Crow combines a sweeping view of European art centers--Rome, Paris, London, Madrid, Brussels, and Vienna--with a close-up look at pivotal artists, including Antonio Canova, Jacques-Louis David, Th odore G ricault, Francisco Goya, Jean-Auguste-Dominique Ingres, Thomas Lawrence, and forgotten but meteoric painters Fran ois-Joseph Navez and Antoine Jean-Baptiste Thomas. Whether directly or indirectly, all were joined in a newly international network, from which changing artistic priorities and possibilities emerged out of the ruins of the old. Crow examines how artists of this period faced dramatic circumstances, from political condemnation and difficult diplomatic missions to a catastrophic episode of climate change. Navigating ever-changing pressures, they invented creative ways of incorporating critical events and significant historical actors into fresh artistic works. Crow discusses, among many topics, David's art and influence during exile, G ricault's odyssey through outcast Rome, Ingres's drive to reconcile religious art with contemporary mentalities, the titled victors over Napoleon all sitting for portraits by Lawrence, and the campaign to restore art objects expropriated by the French from Italy, prefiguring the restitution controversies of our own time. Beautifully illustrated, Restoration explores how cataclysmic social and political transformations in nineteenth-century Europe reshaped artists' lives and careers with far-reaching consequences. Thomas Crow is the Rosalie Solow Professor of Art History at the Institute of Fine Arts, New York University. His many books include Emulation: David, Drouais, and Girodet in the Art of Revolutionary France; The Long March of Pop: Art, Music, and Design 1930-1995; and No Idols: The Missing Theology of Art. He lives in New York City and in Old Saybrook, Connecticut.